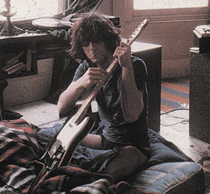 After his tumultuous exit from Pink Floyd, Composer, guitarist, and vocalist Syd Barrett spent several years working on his debut solo album, The Madcap Laughs. Beginning in April 1968, the album was recorded in stages and five different producers were employed, including then-current Pink Floyd members David Gilmour and Roger Waters. When it was finally released at the beginning of 1970, the album was more of a curiosity that a solid rock effort and it found minimal commercial success in the UK. Following the release and success of Pink Floyd’s debut album The Piper At the Gates of Dawn, Barrett started to display counter-productive, erratic behavior. This led to the group adding Gilmour as a fifth member to pick up the slack on guitar and vocals in late 1967. Soon Barrett was no longer able to perform live but the group had hoped he would remain as their primary songwriter and lead vocalist for studio tracks. However, his mental state had deteriorated further and the material he presented to the band was largely unworkable. Barrett was officially dismissed from Pink Floyd in April 1968 and only one of his tracks appeared on that year’s album by the group, A Saucerful of Secrets. Almost immediately upon departing from Pink Floyd, Barrett entered Abbey Road Studios with producer Peter Jenner. Although only one track from these initial sessions would appear on The Madcap Laughs, many tracks were attempted. In July 1968, Barrett abruptly stopped recording and ended up in psychiatric care in his hometown of Cambridge. Early in 1969, a refreshed Barrett resumed work on the album with producer Malcolm Jones. These sessions proved much more fruitful than those of the previous year, with a large part of the album recorded at Abbey Road in April 1969. However, there were still issues with recording as rhythm players had a tough time matching Barrett’s inconsistent timings and chord structures. Soon Jones’ interest in the project began to wane just as Gilmour had started taking an interest in Barrett’s project. In July 1969, Waters and Gilmour were completing Pink Floyd’s Ummagumma when they decided to get involved with The Madcap Laughs. In just a few sessions, they worked on several remade versions and overdubs of previous material along with a handful of new tracks. However, Barrett started to protest further overdubs, so Gilmour and Waters decide to mix the collective material and declared the album complete. With a slowly strummed acoustic and the slightest hint of overdubbed electric guitars, “Terrapin” starts the album complete with many blatant mistakes, especially during the chord changes at the end of each sequence. However, this is part of the charm of the album and Barrett’s vocals are on the same high level as on Piper At the Gates of Dawn. Over five-minutes in duration, the song has a hypnotic vibe along with stream-of-consciousness lyrics. “No Good Trying” follows with a full band arrangement, and a psychedelic sound, animated by drums up front with distant whining guitars and keys in background. “Love You” is upbeat and joyous, bouncy melody over a music hall style piano, while “No Man’s Land” is a droning rocker with good rhythms and bass and a slightly potent lead by Barrett. The haunting “Dark Globe” is the first in the sequence to be produced by Gilmour and Waters, This solo track by Barrett has strummed acoustic and dramatic, deep and desperate lyrics which appear to be Barrett’s first-person account of his own mental state. Concluding the first side is “Here I Go”, a fifties type ballad with elements of English pop and especially dry vocals. Released a few months prior to the album, “Octopus” is the lone single from The Madcap Laughs. This light and melodic track also gave the album its title when Gilmour mistakenly heard the lyric; the lyric; “Well, the mad cat laughed at the man on the border…” The most overtly psychedelic track is the dark and distant “Golden Hair”, which took some lyrics from poet James Joyce sung through haunting vocals. “Long Gone” is the last truly quality track on the album (and perhaps the finest on the album). It features very good acoustic and deep melody, almost Country-like in the verses but more artistic in chorus. Down the stretch, the album does include some really sub-par material. “She Took a Long Cold Look” sounds stale in comparison to the fine preceding track and its rambling and lack of structure (which has a charm earlier in the album) starts to really wear thin here. On the acoustic solo track “Feel”, there is some effective use of reverb at strategic parts but this is offset by the inclusion of studio chatter and the weird false start which reveals Barrett’s incoherent mumbling condition at the beginning of the off-tune “If It’s in You”. The album concludes with “Late Night”, the only song from his 1968 recording sessions with Jenner to make the album. This track features full band arrangement, albeit disjointed, as Barrett’s lyrics of isolation bring the listener back to the original purpose of this album. 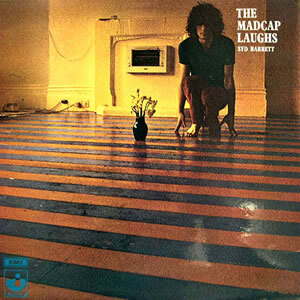 The Madcap Laughs sold just enough copies and got well enough reviews that EMI decided to ask for a second Syd Barrett solo album. A month after this album’s release, recording commenced for what would become the second studio album, Barrett, produced solely by Gilmour. This album features a slightly richer sound, especially in the rhythmic mix, but material is not quite as interesting musically aside from the standout tracks “Baby Lemonade”, “Gigolo Aunt” (which was actually started in 1968), and the closing, stream-of-consciousness track “Effervescing Elephant”, which seems like an appropriate closer to Barrett’s recording career. In June 1970, Barrett performed his first and only solo concert, which was cut short after only four songs when he abruptly put down his guitar and walked off stage. Brilliant album. You either get it or you don’t. If you consider yourself a real fan of Pink Floyd’s 1970 and on music, you owe it to yourself to give this album another 500 listens. LOL You’ll hear the pain Syd was experiencing, yet I think that’s where Syd was most comfortable. Wrapped up, in his own mind…almost invisible to the world around him. Was Syd Barrett a genius or a madman? I believe genius. These aren’t just incoherent scribblings of words onto paper and turned into songs. The lyrics are a gateway into the sub-consciousness that was Syd Barrett. “The mad cat laughed at the man on the border…”??? What’s the title of the album again? Still, great album.